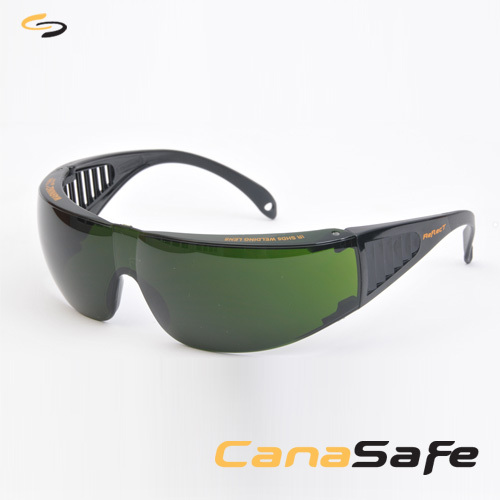 CanaSafe brings you dedicated eye protection technology for cutting and welding operations. ReflecT is designed specifically for welders, providing users with a practical solution for their demanding work environment. Functional, Comfortable, Practical. That's ReflecT. CanaSafe IR5 Welding spectacles are an ideal solution for your workforce. They absorb harmful ultraviolet, visible and Infrared radiation, protecting the eyes & allowing the user to better see the "weld pool". Don't be fooled by "Green" imitation lenses. Always ask your manufacturer for test data certification confirming the lens properties before you procure any IR lens. WARNING: NOT FOR ELECTRIC ARC WELDING. USE ONLY A WELDING HELMET FOR ELECTRIC ARC WELDING.